Buttery shrimp and scallops with a garlic herb crust! Mix shrimp and scallops (or other seafood of your choice) in mixing bowl. Divide the mixture into 4-6 buttered gratin dishes or large ramekins. 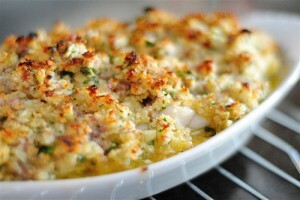 Mix the bread crumbs with herbs, garlic, spices, and finely cubed butter. Evenly divide the crumb mixture atop the dishes. Bake in a preheated 375F oven for approx. 20 minutes. Crust should be golden brown and crispy. Top with freshly grated Parmesan, optional.